Perfect for city life, the BMW 2 Series Active Tourer demands attention with its enhanced style and charming details. The iconic large kidney grille and dynamic silhouette with sleek lines and contoured side skirts create a stylish urban design. The iconic large kidney grille and dynamic silhouette with sleek lines and contoured side skirts create a stylish urban design. When open, the bright Panoramic glass roof* provides an element of open air driving. Closed, it generates a bright, light filled ambience inside the cabin. The large doors make access incredibly easy and the automatic boot door* makes loading and unloading the 1,510 litres of luggage space effortless. Modern hexagonal lighting silhouettes and headlights create an athletic touch alongside the stylishly designed rear apron and prominent exhaust tailpipes. As well as its space and adaptability, the BMW 2 Series Active Tourer ensures ease of use as all displays and controls are arranged within easy reach. The fine-grain brushed aluminium interior trim* and the stylish three-spoke sport steering wheel with contoured thumb rests add a hint of style. Enjoy the highest quality surround sound courtesy of the Harman Kardon 7.1 system*, boasting 12 speakers which are designed to enhance the interior’s sound characteristics and promises an excellent sound experience. The wireless charging dock* allows you to charge your smart phone with ease and BMW ConnectedDrive comes as standard with Real-Time Traffic Information (RTTI), and BMW Remote Services which syncs seamlessly with the BMW Connected+ app. Featuring free-revving, efficient engines with enhanced aerodynamics, the BMW 2 Series Active Tourer will power your everyday and handle any adventure it is presented with. Complete with Driving Experience Control drivers can easily change between driving modes at the touch of a button, from comfort to sport mode. Select from a choice of engines, from the 3-cylinder diesel engine to the striking torque of the 4-cylinder petrol engine. 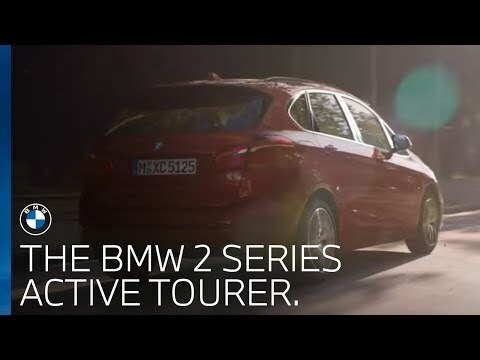 The BMW 2 Series Active Tourer ensures a smooth drive thanks to the range of transmissions* and the sporty 7-speed double clutch transmission* Add to this the intelligent xDrive all-wheel drive system* and you have exceptional increased control.